Over the years I've been asked to do tutorials on how we garden. It's funny to me because we're not the best gardeners out and we are continuously learning as we go (and we've been gardening for nearly 10 years) so I've never felt comfortable sharing because we're no experts. But, having said that, and you guys knowing I'm no master gardener, I've decided to go ahead and share how we go about our garden. It's not perfect. We have a lot to learn. But it's what we do and love so here's how we #zellersfarminourbackyard (that will make sense if you follow me on instagram, @lesleyzellers, if not, it's just a collection of pictures from our gardening adventures this past year). 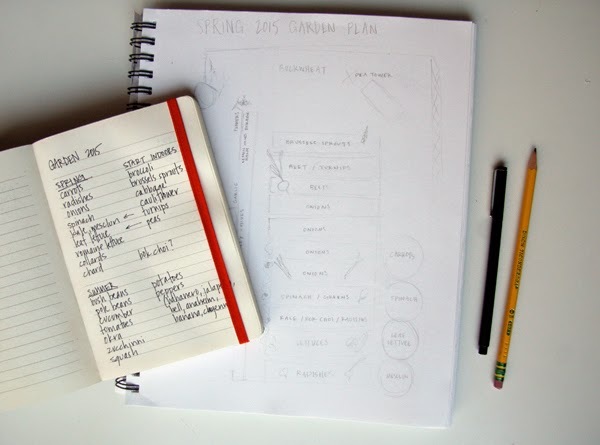 For us, the first step in growing food in our backyard is PLANNING. So my first tip is to do your research. 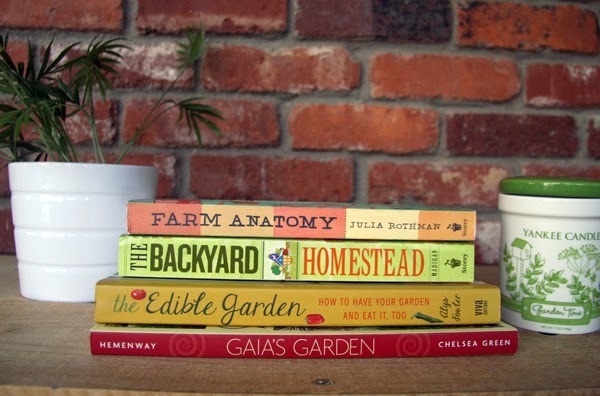 Read blogs about gardening, look at pinterest for layout ideas, read books. Researching will give you an idea of what you want your garden to look like and what you want to grow in it. Take notes, draw plans, scheme and dream. Most of our growing knowledge was passed down from my grandpa. He grew just about everything in his backyard. Over the years we've mixed in his knowledge with other ideas we've read from various sources. Gaia's Garden - I haven't read it but my husband has. It's a whole lot of permaculture and really good ideas. I'm thankful he read it and has instrumented different principles from it in our garden. The Edible Garden - it ties in with the idea of permaculture but also dives into specific ideas of laying out your garden in a natural way. No rows. More what works best together and how to make the most out of your space. I really like it because it talks specifically about the major plants and how they grow best. The Backyard Homestead - really amazing for garden planning on a small lot with big produce! Farm Anatomy - great design and super basic facts on all farming principles. Not detailed but a really good resource for all farming. The Vegetable Gardener's Guide to Permaculture - not pictured because I found it after this post, but one of my absolute favorites! 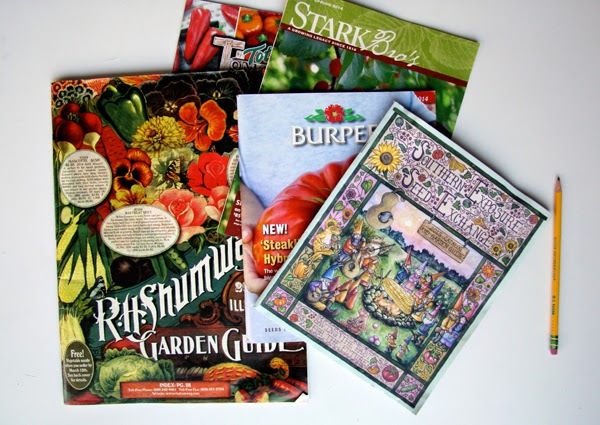 Get yourself a seed catalog. Any will do. It will give you an idea of all the things you can grow. Highlight, dog-ear, make a list of the things you'd like to grow. Write it all down! Even if you don't feel like you can do it all this year, it's good to know where you want to go. 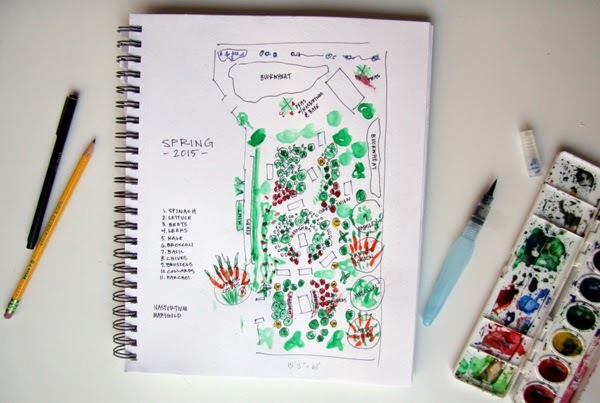 Sketch out your space and start thinking what you want to plant where. You'll need to know how the sun moves across your space so you can plant accordingly. Plant smaller things and plants you'll harvest frequently up front with taller ones behind them. Plants like ground cover, radishes, lettuces and greens stay short so no need to worry about them blocking each other out. That first sketch was my original layout for this spring. We've always worked in rows. It's easy to plan, pick and change but it also has it's drawbacks. So we're trying something different. The next sketch shows our new approach, called polyculture (what the Edible Garden and Backyard Homestead reference). The idea is called polycutlure. The thought is planting more in line with nature. No straight lines, mixing in plants that grow well together or benefit each other. It's supposed to limit the need as there's less ground open. It's also supposed to help disease from spreading from plant to plant and a ton of other great reasons to try it. That's a whole different post in itself. We also do a mix of buckets and pots throughout the garden. I like the different levels they bring. It's also good to contain plants that get out of control, like mint. I also like doing carrots in buckets because their roots seem to do better. We also have chickens so we planted herbs and things they can eat, like comfrey, along the inside of the fence. They can snack on the leaves and flowers that stick out of the fence and appeases them enough to stay out of the garden. Plus it's really good for chickens to eat herbs. In addition to comfrey, we also plant borage, buckwheat and yarrow to give to our chickens. I won't go into detail on those here (because this post is already crazy long) but if you're not familiar with them, google them. They are so beneficial to have in your garden. Especially if you have chickens!! Once you have your plan, what you want to grow and where - get the seeds. You can order them from a million places online, buy them from a local nursery, of get the ones you saved from last year's garden. Local favorites are Carmichael's and Stringer Nursery. It costs less to start seeds as opposed to buying the plants but it also takes a lot more work. We've always done a mix of both but this year we're going to try to start all our plants from seeds. If you want to start seeds indoors, here are some we're doing: broccoli, brussels sprouts, cabbage, cauliflower, celery, various greens, herbs and tomatoes - to name a few. That's it on planning. Are you still here? If so, let me know if you found this in any way helpful. I never know what to share when people ask about our garden so I hoped I answered some questions . To end, here's a quick video I shared on instagram of our #farminourbackyard adventures from 2014. I'll share more as the growing season moves along and let me know if you have specific questions you'd like me to address. Thanks and happy garden planning! We order from Rare Seeds, an all Non-GMO seed company. They have so many unique seeds, and I love that I can replant the seeds from the plant the next year. I would love to know more about how you feed your chickens and the other things you mentioned in this post! This was really helpful, thank you! I loved all of your photos this past year. I've been gardening for a few years now but never with any huge success other than herbs, tomatoes, tomatillos, eggplant, and green beans. I don't use pesticides so bugs have been a major factor (I'm in Georgia). Wish I could build a greenhouse, chicken coop, and beehive but my husband just rolls his eyes :) Things I hope to actually eat this year: broccoli, lettuces, brussel sprouts (mine grew beautifully but all opened up before they were big enough to pick). I will look into those books - thank you! I need to read up on garden planning and companion planting a little better too probably. I've just been doing a block of this, then a block of that, down the raised bed. Anyway, thanks! I know you do composting, would love a tutorial on that. But if I haven't been composting (yet), can I successfully do a backyard garden?? What do I do instead for soil and fertilizer? Yes, thanks for the recommendations. I bought a house that has a large lot, and I was thinking I should try some gardening. Great ideas! I started gardening last year and hope to really make the most of it this year! Thanks for sharing, I look forward to more. You are really good at this! I have done the research but haven't gone as far as making a blueprint for my garden! I think I should do the same so I know where to put what next time I re-plant.